Our company supply Wood Decking, Under Construction (Bearer), Tropical Rough Sawn Lumber from own production as well from reliable producers in South America to our worldwide clients. 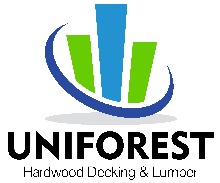 Uniforest provides to you a complete support in all your needs of Purchasing of Tropical Hardwood Products. Inventories and Availability of more than 100 sawmills & decking producers in all over Brazil, Peru & Bolivia. Direct prices mill, guaranteed lowest freight rates, quality control of goods and shipping monitoring as well online cargo's tracking system . Essence/matériau: Maçaranduba (Bulletwood, Beefwood, Quinilla), Origine: Special Offer, Type: Lame de Terrasse (1 face rainurée), Quantité: 20.0 - 22.0 m2 (sqm) Ponctuellement, Largeur: 120 mm, Longueur: 1800+ mm, Epaisseur: 21 mm, Qualité: A Grade / KD 12-14% with one side Antislip or smooth.